Geologists can have a weird kind of double perception of places, seeing the world as it is, but also seeing the world as it was in the past. I’m sitting here in Durango, wondering what the weather will be like tomorrow. But in my mind, I’m also 25,000 years in the past, looking down on the outwash plain from the Pleistocene glaciers that covered the San Juan Mountains. Or maybe I’m sitting on a delta, watching the Cretaceous interior seaway recede. Or maybe it’s 1.7 billion years ago, and I’m watching a continent grow. 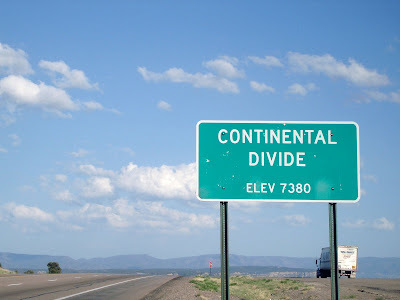 I was thinking about this last week, as I drove down into the San Juan Basin, and up over the Continental Divide. In Durango, it can be easy to mix up today’s topography with that of the past fifty million years. Both the mountains and the rocks slope upwards to the north, and the rivers drain south. To go downhill on the road means to drive into younger and younger rocks, from the Precambrian granites and gneisses exposed in the canyon of the Animas River to the Paleogene sediments of the San Juan Basin. And Farmington, New Mexico, the center of the basin’s energy industry (though, like Durango, it sits on the geographic edge), is somewhere around a thousand feet lower than Durango. So I think of New Mexico as being down: down topographically as well as down on the map. Somewhere around fifty, sixty, seventy million years ago – I don’t know the dates, and I’ve read arguments about them, but it was late Cretaceous through early Paleogene – my part of western North America started to get its mountains. However the Laramide orogeny was caused (flattening of the subducting plate under California and Nevada is the model that has survived the most criticism), by around seventy million years ago, it was forming isolated mountain ranges and basins all through the intermountain West. The rocks on the edges of basins are bent up into hogbacks and monoclines, probably faulted at depth. And in the middle, there’s sediment. Lots and lots of sediment. In the San Juan Basin, there’s gray and green and slightly purplish shale and siltstone with tongues of sand, and there’s a tan sandstone that caps it all. The Four Corners Geological Society wanted to put scenic highway signs explaining it. The state of New Mexico laughed at them, but there is a certain lonely beauty to the badlands. So in the Paleogene, water flowed down from Durango and into the San Juan Basin, and dumped mud, and sand, and sand, and mud, until the sand and mud were thousands of feet thick. (And then the coal beneath the sand and the mud got hot enough to make natural gas.) And as I drive across northwestern New Mexico, two hours between towns, I think about the basin. The Continental Divide in New Mexico isn’t that high, but it still separates the arroyos that flow towards the Colorado River from those that aim at the Rio Grande. The divide itself lies in sandstones at the top of the San Juan Basin sequence. At one point, rivers flowed there and deposited sand. Somehow, I think of that spot as a geologic low point: the basin. But sometime after the San Juan Basin filled with sand and mud, the Rio Grande Rift pulled New Mexico open on one side, and the Basin and Range dropped the base level in Arizona on the other, and the two great rivers went their separate ways. And this spot, in the San Juan Basin, now separates them. You've done a great job describing the way geologists can be thinking about past and present, and more than one past even, all at the same time - and driving downhill into the past - it's great! Do you have any more about the Laramide orogeny? It seems like the flat subduction model is used to explain the extreme extension in places, and uplift in other places - or maybe I'm behind on this? I've been meaning to post about ideas about the Laramide orogeny - there was a paper in GSA Bulletin recently that I would like to discuss and put into context. But those kinds of posts take time to put together! Would it be unethical to publish this image? Using blogs to advertise for jobs?